Home / General Discussion / IT Project Leaders or Managers? Driving home, listening to the radio the other day, the Shangri-Las came on with their classic hit “Leader Of The Pack”. 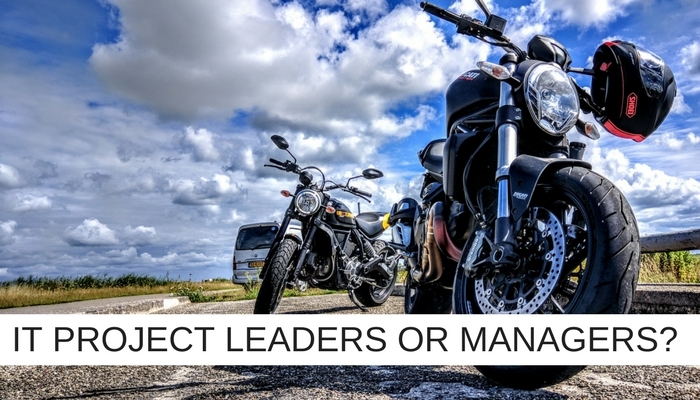 It jumped out at me, not least because of the noisy motorbike sound effects but also because I had been contemplating the value of writing a blog on the difference between IT Project Leaders and Managers. Was one better than the other when it comes to delivering business outcomes through IT Projects? I smiled to myself as I imagined the Shangri-Las singing about the “Manager of The Pack”. It would probably have been a very different song! In the same way, projects that have a leader tend to be very different to those with a manager. On the whole, they challenge, advance and inspire. In my experience, the IT projects that you look back on as being groundbreaking are the ones with a project leader at the helm. This is by no means a negative reflection on Project Managers. Some IT Projects are better ‘managed’ than ‘led’. You will have worked on some yourself where a steady hand at the wheel is more effective, where a ‘hands on’ attention to detail or appropriate delegation of tasks can make all the difference. Quite often natural project leaders can struggle in these environments as much as some project managers toil with radical change programmes. There was a case a couple of years back where a UK public sector IT Project needed the kind of management that necessitated not just the dotting of ‘i’s and crossing of t’s but also the dotting of lower case j’s and crossing of f’s. The person heading up the project, though, was a leader. The Project was led by the kind of person who can naturally take a helicopter view but not someone who will land the helicopter and roll up their sleeves in the case of an emergency. The project failed on many levels, but I often wonder whether a seasoned, albeit less dynamic, Project Manager might have had more success. SO … In the same way that you delegate individual tasks carefully, choosing a manager or a leader on a project by project basis can have measurable effects on the outcomes delivered. AND … This is often the problem. When you have talent in place, whose skills don’t match the needs of your project a capability gap opens up that can have a dramatic negative effect on your outcomes and deliverables. What do you do when you have a manager but need a leader … or vice versa? The good news is that the Project Management as a Service sector identified this potential gap some time ago. You can now access services and people who will complement your Project Delivery offer or, if need be, you can even hire in an end to end management service. Organisations with a strong project management team are using the latter, end to end leadership service to score greater results on more complex and dynamic projects – they effectively buy in a CIO for as long as they need them. Similarly, businesses with strong leaders are finding that their talent is deployed better by focussing time and skills on their overall project portfolios while delegating the ‘detail’ to a PMaaS partner. There are then also a number of companies who benefit from solutions between these two extremes. Management and leadership are often treated as the same thing but their central, pivotal functions can be, if not polar opposites, very different. Warren Bennis, a pioneer in the field of leadership studies said, “The manager accepts the status quo; the leader challenges it.” Which is fine, but sometimes you need to manage the status quo … that’s what keeps it “the status quo”!! In other words, you have to dot every lower case j … or you end up with a horrendous mess on your hands. William Arruda, the author of ’13 Things All Successful Professionals Do To Fuel Their Careers’ listed nine differences between leaders and managers in a piece for Forbes. While there are some points on William’s list that I disagree with, few could argue with his suggestions that leaders create a vision and managers create goals, leaders take risks and managers manage them or that leaders are change agents and managers maintain that status quo alluded to by Warren Bennis. None of these things makes leaders better than managers though and if you need goals and carefully managed risks – you could argue that a manager would be the go-to guy and not a leader. There was a move in certain IT Project circles to try to replace traditional managers with leaders. I think this was a mistake. Certainly, we need to develop more leaders but not at the expense of effective project managers. I guess these circles simply needed to change their perception of project management, see it for what it is and what it can bring to the table and enjoy and accentuate the positives of the function. So Managers are equally as important as leaders. However, for leadership and management to co-exist in your organisation, they each have to exist as separate entities in the first place. If you need the skills of one or the other and you don’t have them, before you try to muddle through or panic, check out the PMaaS market. Previous At harvest time what can IT project managers learn from farmers?